Of course, Christmas wasn’t invented in medieval times. Throwing a midwinter feast, lighting the fire, lighting candles and decorating the inside of the house with evergreens are all fairly obvious ways of cheering oneself up when it is cold outside. And they are customs that have persisted for perhaps thousands of years, and withstood the full frontal attack on Christmas which came later. It was a custom of the pagans to celebrate on the same 25 December the birthday of the Sun, at which they kindled lights in token of festivity. In these solemnities and riutals the Christians also took part. Accordingly when the doctors of the Church perceived that the Christians had a leaning to this festival, they took counsel and resolved that the true nativity should be solemnized on that day. Invaders adapted the feast. 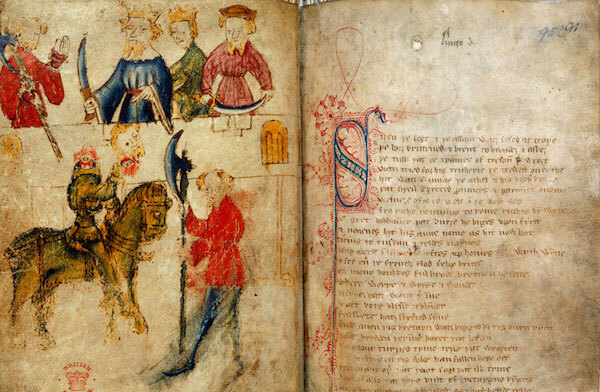 In the 11 century the Danes ruled England and introduced the word “Yule” – the Scandinavian term for Christmas. Now they are influencing us again with their “hygge” export – the philosophy of cosiness and lighting candles. Ivy stood without the door, she is full sore-a-cold. Account books of the late medieval and early Tudor period show that candles were ordered in huge quantities by churches and cathedrals. Who then (but the miser?) but openeth his door? Many aristos opened their doors. The earl of Northumberland had four swans for dinner and received clerical dignitaries. The Mayor of Coventry kept “open house” for all. The duke of Buckingham employed a troupe of French players, three jesters, the municipal musicians of Bristol, and an acrobat. Plus there was card-playing and board-gaming, as today. One year Richard II had 20,000 guests who consumed 200 oxen and 200 tubs of wine. A Christmas dinner provided by Henry V offered brawn, dates with mottled cream, carp, prawns, turbot, tench, perch, fresh sturgeon with whelks, roasted porpoise, crayfish, roasted eels and lampreys, leached meats garnished with hawthorn leaves, and marzipan. Christmas, like Saturnalia, has always been the season for a certain amount of legitimized disorder. Each year a Lord of Misrule was appointed and given throne, canopy, armoury, jester and a gibbet for hanging those who displeased him. An echo of this is seen today by the drunks wearing antler horns and swaying around the streets at night. That is the true spirit of Christmas: anarchy. Wassail, wassail, that never will fail. Trees were wassailed in the orchards to ensure a bountiful crop and again, this tradition continues among former punks. It was season for singing carols. “At Christmas of Christ many carols we sing,” said Tusser. And the season has always been about gifting. On New Year’s Day in the 15th century, trumpets sounded at court as the king put on his shoes, and the presents arrived from the queen. Gentry exchanged presents with their servants. New Year’s presents were a forerunner of today’s Christmas presents. Twelfth Night was the occasion of a religious service in the morning and then a massive blow-out. Have little or nothing to do. I wish their numbers were increased. In the 16th and 17th centuries, Christmas came under attack. The Reformation had started to dismantle the merry old ways, and Christmas was now seen as a hopelessly Pagan relic of an outmoded version of Christianity. It was regarded as Popish and idolatrous by the new breed of Puritans, as personified by the humourless, self-important Malvolio in Shakespeare’s Twelfth Night, a play about the invasion of the fun haters. 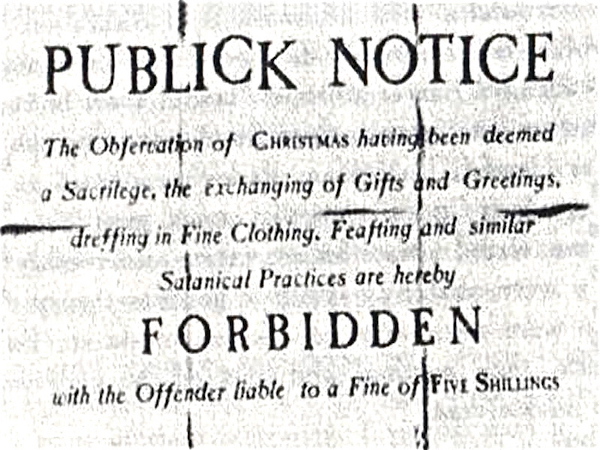 Scotland got in there first with a ban on Christmas in 1561. They said that the “Papists have invented” Christmas. In England, we have reports from the 1630s that some cranks protested against Christmas as a Popish survival by keeping their shops open, but they were seen by most people as eccentric. Sobriety at Christmas is a challenge. But it’s better than the alternative. Christmas is ruined by children. Why I’m Opting out of Christmas. Warning: your festive meal could be more damaging than a long-haul flight – George Monbiot. It’s time or a real War on Christmas. People died for Christmas. The ordinary folk revolted against the Christmas ban. In 1647, there were riotous celebrations by Royalists in Ipswich and Norwich and one reveller was killed. Christmas was celebrated in secret: diarist John Evelyn reports that a Royalist congregation celebrating Christmas was arrested by soldiers. There were illegal Christmas parties, like raves, and the authorities went round trying to break them up. In the 18th century, Christmas limped along. It certainly underwent a decline during the Industrial Revolution, when attempts were made by factory owners to turn transform us from a nation of hard partyers to hard workers. In deference to the new spirit of hard work which replaced the old medieval ethic of merriment, Christmas was reduced from twelve days to one, and workers were allowed only two days holiday per year. Time for leisure and enjoyment of life was drastically cut back. It wasn’t really until Dickens that Christmas regained its medieval and old-fashioned character as a feast for the senses and a time for ruddy-cheeked chuckling. A Christmas Carol was published in 1843 and everything changed. 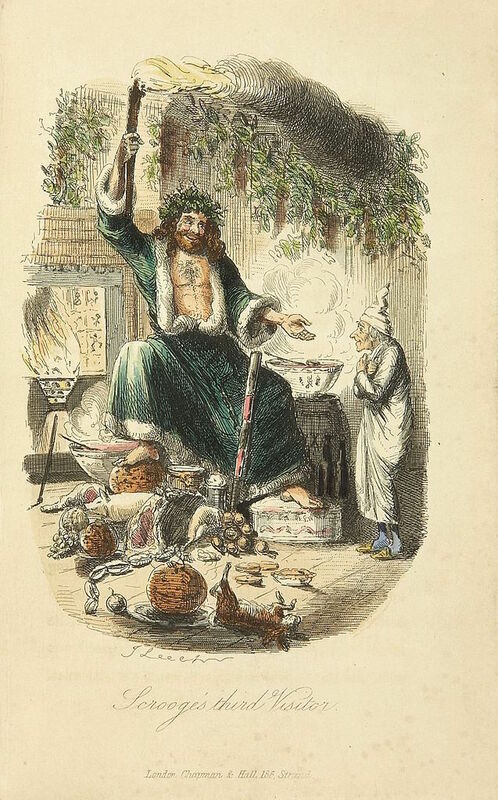 The new, miserable, industrial, puritanical spirit of money-making and hard work was lampooned in the figure of Scrooge, and the medieval spirit was celebrated through the amiable Fezziwiggs. The book had a huge influence on our culture and influenced the proper direction of Christmas – backwards. In came a fiddler with a music-book, and went up to the lofty desk, and made an orchestra of it, and tuned like fifty stomach-aches. In came Mrs Fezziwig, one vast substantial smile. In came the three Miss Fezziwigs, beaming and lovable. In came the six young followers whose hearts they broke. In came all the young men and women employed in the business. In came the housemaid, with her cousin, the baker. In came the cook, with her brother’s particular friend, the milkman. In came the boy from over the way, who was suspected of not having board enough from his master; trying to hide himself behind the girl from next door but one, who was proved to have had her ears pulled by her mistress. In they all came, one after another; some shyly, some boldly, some gracefully, some awkwardly, some pushing, some pulling; in they all came, anyhow and everyhow. Away they all went, twenty couples at once; hands half round and back again the other way; down the middle and up again; round and round in various stages of affectionate grouping; old top couple always turning up in the wrong place; new top couple starting off again, as soon as they got there; all top couples at last, and not a bottom one to help them. When this result was brought about, old Fezziwig, clapping his hands to stop the dance, cried out, “Well done!” and the fiddler plunged his hot face into a pot of porter, especially provided for that purpose. But scorning rest, upon his reappearance, he instantly began again, though there were no dancers yet, as if the other fiddler had been carried home, exhausted, on a shutter, and he were a bran-new man resolved to beat him out of sight, or perish. There were more dances, and there were forfeits, and more dances, and there was cake, and there was negus, and there was a great piece of Cold Roast, and there was a great piece of Cold Boiled, and there were mince-pies, and plenty of beer. But the great effect of the evening came after the Roast and Boiled, when the fiddler (an artful dog, mind! The sort of man who knew his business better than you or I could have told it him!) struck up “Sir Roger de Coverley.” Then old Fezziwig stood out to dance with Mrs Fezziwig. Top couple too; with a good stiff piece of work cut out for them; three or four and twenty pair of partners; people who were not to be trifled with; people who would dance, and had no notion of walking. Message to vicars: embrace the Logos!